Home entertainment roomStream full HD videos across multiple devices without having to ever worry about buffering again. 1. Port LED On/OFFGo stealth or light it up with a flip of a switch. 3. 10-Gigabit/Multi-Gigabit PortsTake your network to hyperspace speeds. 2. 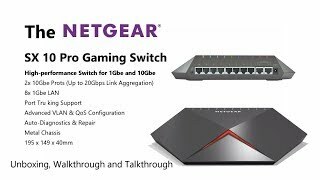 Gigabit PortsSeamlessly stream and game without fear of buffering. Looks great with my razer keyboard and other accessories with rainbow lights. This is also one of the cheapest 10GbE switches. Improving latency to nearly zero with cat7 cables.